On Jan. 12, Green Cove Springs Elks Lodge #1892 used funds from an Elks National Foundation Promise Grant to host a kids' fair for the youth of the community. Participants spent a fun-filled afternoon learning the importance of fire safety, bike safety, exercise, nutrition, goal setting and drug awareness. They also had their pictures taken with Elroy the Elk. Twenty-four lodge members and volunteers, including Florida Elks Children’s Therapy Services therapist Janet Bryant and members of the Clay County Sheriff’s Office and Clay County Fire Department, were on hand to assist the children and their parents. Lunch was provided, and participants left with educational materials including Elks drug awareness education items and prizes to encourage active lifestyles. 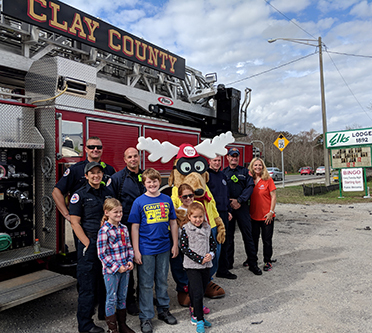 Participants are pictured with Clay County firefighters; Elroy the Elk; and Exalted Ruler, Lucie Barnette, at Green Cove Springs Lodge’s kids’ fair Jan. 12. 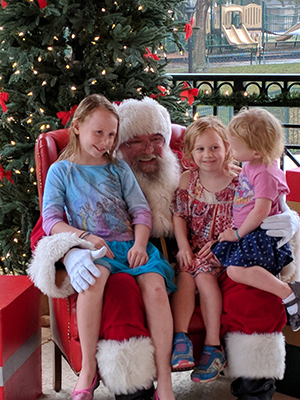 On Dec. 1, using funds from the Elks National Foundation Promise Grant and from the lodge's PER Association, Green Cove Springs Lodge continued their tradition of sponsoring Santa's Workshop. This event is held in connection with the city of Green Cove Springs’ annual Christmas parade. After visiting with Santa, children and their families are greeted by lodge members and volunteers who happily hand out gift bags packed age-appropriately for infants through teens. 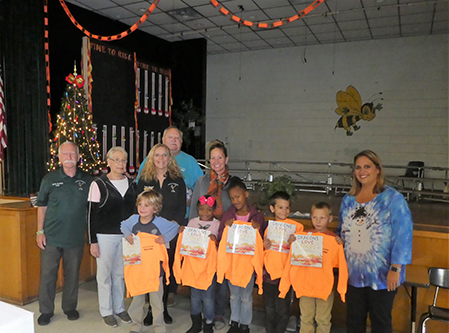 On Dec. 6, Green Cove Springs Lodge used the Elks National Foundation Anniversary Grant to donate sweatshirts and books to the first-grade students at Charles E. Bennett Elementary School. Each of the 88 students received two books and a sweatshirt just in time for winter vacation. Remaining funds were donated to the school's resource teachers for classroom supplies. Pictured are Green Cove Springs Lodge’s Rick Kunze, PER; Penny Kunze; Lucie Barnette, Exalted Ruler; and Clyde Mixon, project coordinator, delivering books and sweatshirts to Charles E. Bennett Elementary School’s Erika Gallo, art teacher; Sarah Lawson, principal; and several first-grade students. 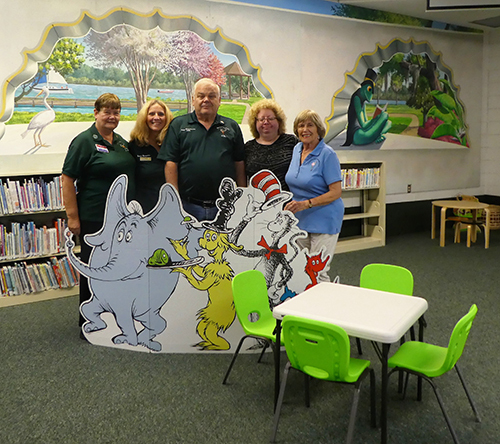 Green Cove Springs Lodge donated four folding tables and 16 chairs to the Green Cove Springs Branch Library for use with their many preschool children’s programs. 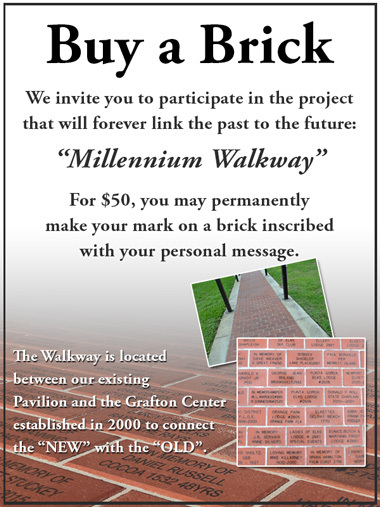 The lodge used the Beacon Grant matching funds received from the Florida State Elks Association to make the purchase. Linda Rittenhouse, FLOE Treasurer; Exalted Ruler, Lucie Barnette; and Gene Rittenhouse, PER, delivered the gift to the library’s branch manager, Jennifer Parker, and Friends of the GCS Library VP, Dee Pratt, Nov. 5. The charity bingo funds from Green Cove Springs Lodge’s PER Association sponsored a team in the local annual Quigley House Purple Ribbon golf tournament. Quigley House is Clay County’s only domestic violence and sexual assault center. 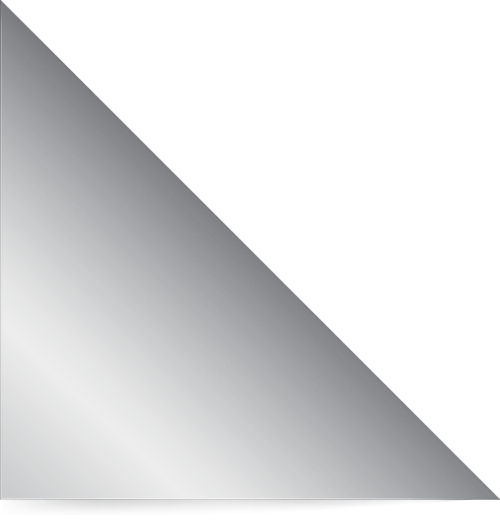 Its services are provided to survivors free of charge. The donation of $1,000 allowed the lodge four entries in the tournament. The lodge has the tradition of inviting first responders to use the entries. This year’s players were from Green Cove Springs Police Department and Public Works. 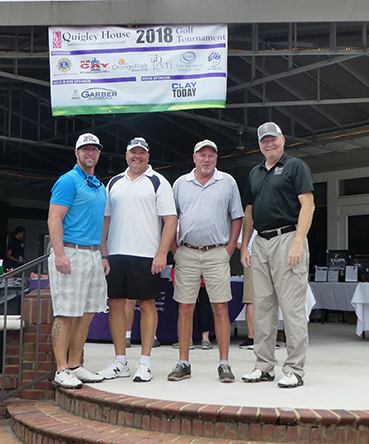 Green Cove Springs Lodge’s PER Association sponsored James Ottomeyer and Shawn Hines of Green Cove Springs Police Department, Steve Thomas of Green Cove Springs Public Works, and Mel Acres of GCSPD to play in the Quigley House Purple Ribbon golf tournament. 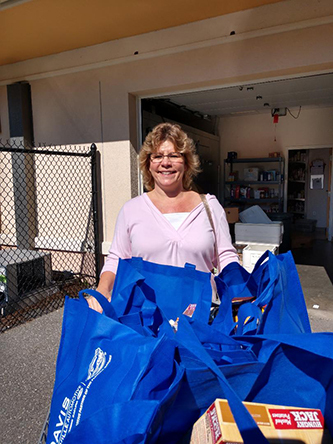 On Nov. 19, Gainesville Elks Lodge #990 donated more than 150 Thanksgiving food baskets to local veterans and families in need or in crisis as well as to Glen Springs Elementary School for its annual food drive. Their goal of 150 baskets was in recognition of the Elks 150th anniversary. The lodge used an Elks National Foundation Promise Grant to make this happen. Over 100 meals went to local veterans and more than 180 pounds of food were donated to the Catholic Charities agency. Gainesville Lodge Lecturing Knight, Susan Senterfitt, shops for the items for the lodge Thanksgiving baskets. Green Cove Springs Elks Lodge #1892 participated in the annual Green Cove Springs Police Department's trunk or treat event Oct. 27. Florida Elks Children’s Therapy Services therapist Rae Montgomery assisted lodge members with giving out treats as well as drug awareness ribbons and information about Elks services. Over 2,600 community members enjoyed a fun-filled holiday evening. 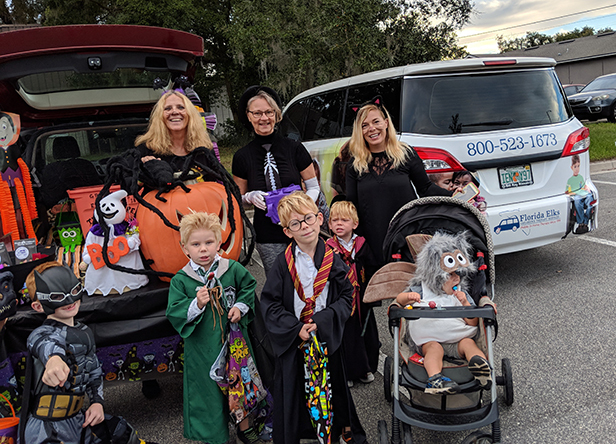 Green Cove Springs Lodge Exalted Ruler, Lucie Barnette; FECTS therapist Rae Montgomery and local families enjoy the Green Cove Springs PD trunk or treat event Oct. 27. 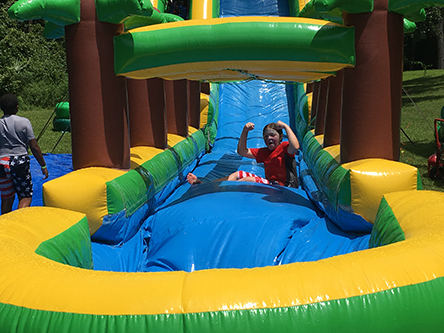 On July 21, Gainesville Elks Lodge #990 held a Summer Splash Family Fun Day to benefit autism. The lodge’s outside areas were filled with all kinds of activities including a large water slide, a bounce house, a slip and slide, kiddie pools, a dunking booth, face painting, and a ping-pong ball toss. Free food was provided along with lots of free ice cream! Donations were accepted to benefit CARD, the Center for Autism and Related Disabilities. This annual lodge event is funded by an Elks National Foundation Gratitude Grant. 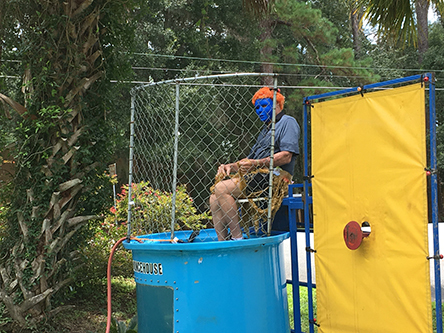 Gainesville Elk member Jerry Sartain takes a turn in the dunking booth while attendee Evelynn June Brown enjoys the water slide. Green Cove Springs Elks Lodge #1892 used its Promise Grant to provide guitar lessons for students throughout the summer. Ten students met every Tuesday for seven weeks for group lessons and lunch and then treated the lodge members to a recital. 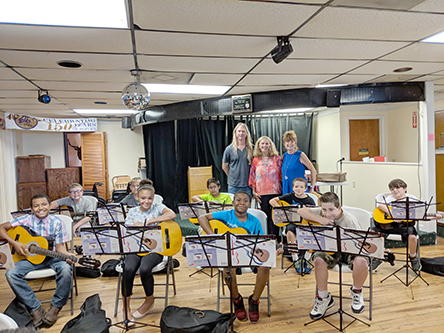 Project coordinator, Jeannie Calhoun, used the grant to provide the lessons and outfit each of the students with a guitar, music stand, tuner and book. Instructor, Curt Townes; Green Cove Springs Exalted Ruler, Lucie Barnette; and project coordinator, Jeannie Calhoun, are pictured with the guitar students preparing for a lodge recital. On June 5, Green Cove Springs Lodge used an Elks National Foundation Beacon Grant to promote the Green Cove Springs Public Library’s opening of the summer children’s program. This was the lodge’s third year of promoting this program. 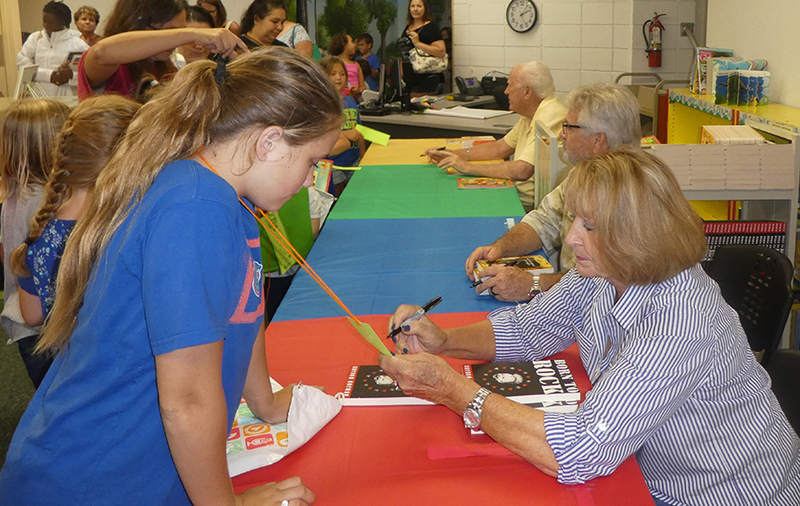 The event’s purpose was to encourage children to sign up for the special library programs for children of all ages. There were 119 children accompanied by 49 adults in attendance and 25 volunteers. After registering, each child went through the following stations: registration for summer programs, a book station where they received a free age-specific book, an ice cream station, a craft station, a balloon toy maker’s station, a face-painting station and a corn hole game area. Green Cove Springs Lodge members Karen Pitts, Willie Pitts and Joe Boyd give out age-specific books to each attendee at the opening of the local library’s summer children’s program. 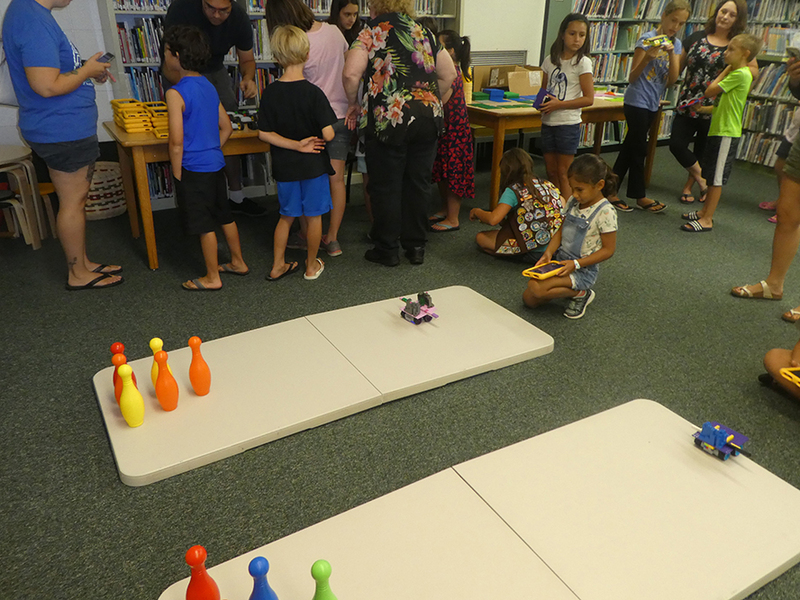 Green Cove Springs Library began their MeeperBot Training Program using MeeperBot robots provided by Green Cove Springs Lodge through ENF Beacon Grant matching funds from the Florida State Elks Association. The first training session included building Lego block tops for the robotic platforms, instruction on controlling the platforms with Kindle Fires and driving their bots down a table to knock down bowling pins. The next sessions included learning to program the platforms to perform different tasks automatically. Librarian and lodge member, Jennifer Parker, was the main instructor of the 26 attendees while parents and siblings observed. An attendee drives her MeeperBot down the course using a Kindle Fire to control it at a Green Cove Springs Library class. The robots were provided by Green Cove Springs Lodge. 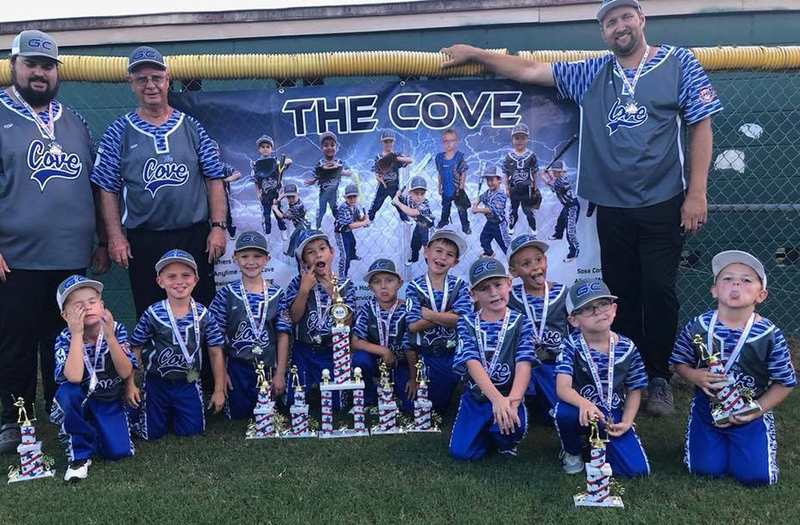 Green Cove Springs Lodge’s charity bingo donated $300 to the Green Cove Springs Baseball/Softball Association to aid the 8U T-Ball team going to the Florida state championship tournament. The team won third place. 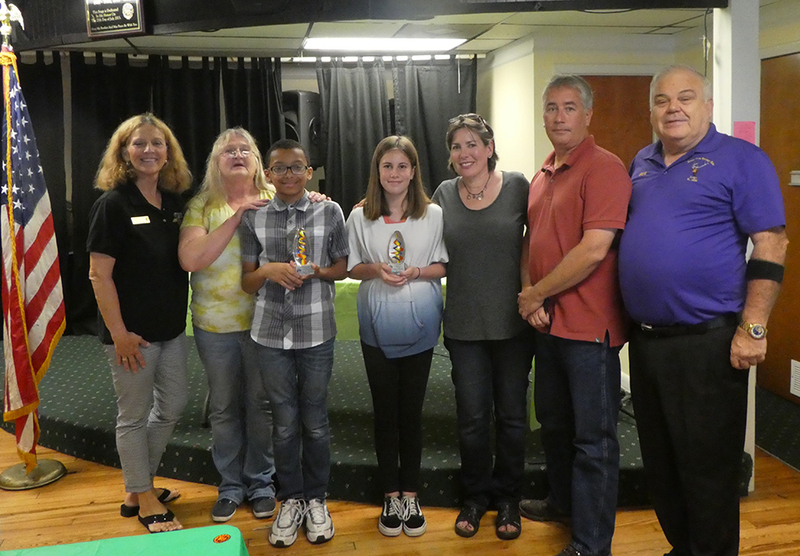 The second annual Charles E. Bennett Elementary School sixth-grade classes’ luncheon was hosted by the Green Cove Springs PERs’ Elks charity bingo June 1. Ninety-seven students and school personnel were present. The luncheon concluded with the presentation of two lodge citizenship awards to Celia Lombardi and Devan Carney. They were selected by their teachers for the award based on their behavior, ability to work well with others, grades and helpfulness. A highlight of the luncheon was Tatyana Floyd singing a song she wrote. The luncheon chairman was PER Gene Rittenhouse, Bingo Vice Chairman. The luncheon was served by 14 lodge members and helpers. Green Cove Springs Lodge Exalted Ruler, Lucie Barnette; Devan Carney’s grandmother; Devan Carney; Celia Lomardi; Celia Lombardi’s parents; and PER Gene Rittenhouse are pictured at the luncheon for sixth-graders. 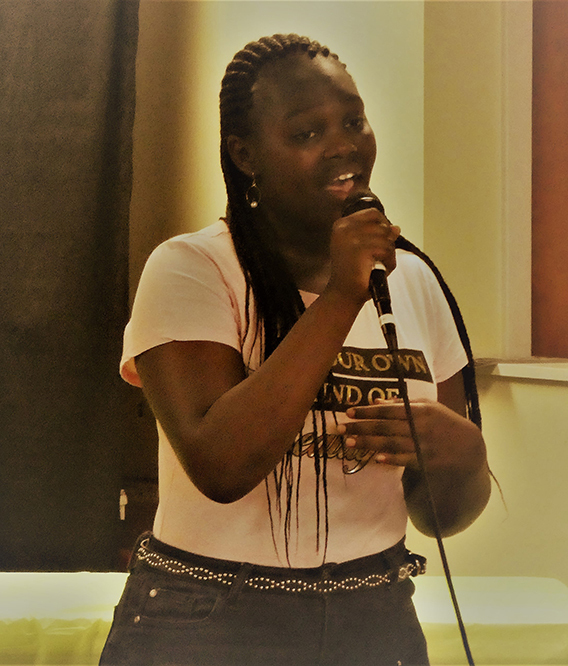 Tatyana Floyd sings a song she wrote for the sixth-grade class during Green Cove Spring Lodge’s celebration luncheon.